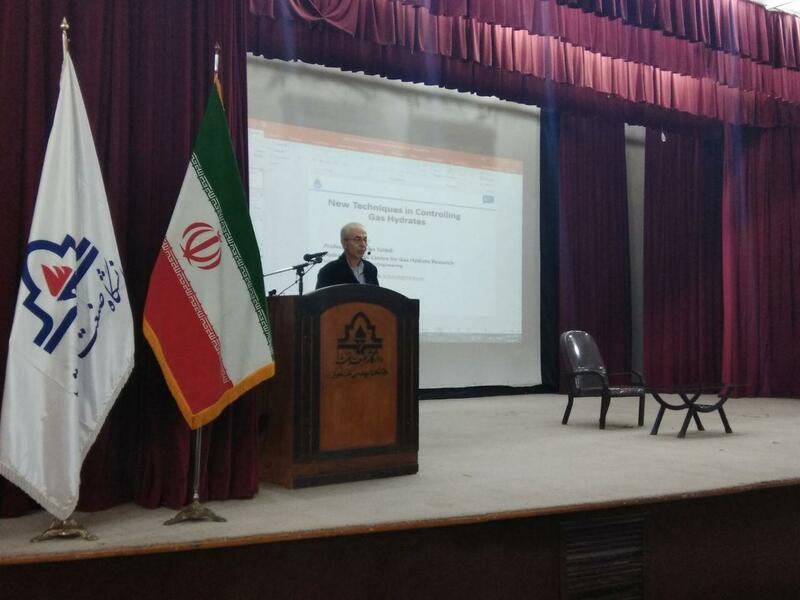 Professor Bahman Tohidi, Managing Director of Hydrafact and Director of Centre for Gas Hydrate Research at Heriot-Watt University gave an speech on New Techniques in Controlling Gas Hydrates at Petroleum University of Technology (PUT), Ahvaz, Iran in January 2018. The well received presentation slides can be downloaded from here. Aberdeenshire-based service company, Blue Gentoo, and Hydrafact have signed an agreement to bring a range of patented gas hydrate management technologies to market. Blue Gentoo will market Hydrafact’s™ hydrate monitoring equipment, HydraCHEK®, as exclusive global distributor, focusing initially on customer demand from West Africa, Asia, Europe and Australia. It is expected that this will result in a business turning over £3 million and employing 20 people within 3 years. Lifetime Achievement Award for “University and Hydrafact Gas Hydrates Expert” at the 9th International Conference on Gas Hydrates. Professor Bahman Tohidi, Director of the Centre for Gas Hydrate Research and Centre for Flow Assurance Research (C-FAR) at Heriot-Watt and Managing Director of Hydrafact, has been given the International Lifetime Achievement Award at the 9th International Conference on Gas Hydrates, in Denver, Colorado. Hydrafact-HWU work was recognised as one of the UK top 10 examples on the role of “Chemical Engineering in the Modern World” by Institute of Chemical Engineers (IChemE). Hydrafact novel solution for “KHI Removal from Produced Water” was among the finalists in the “Chemical Engineering Industry Project of the Year Award” at the IChemE Global Awards 2016. Hydrafact is planning to start a Joint Industry Project in collaboration with a major Processing company to commercialise the process. Please contact us if you require further information. Hydrafact contribution to Queen’s Anniversary Prizes was recognised by "Institute of Petroleum Engineering, Heriot-Watt University". Hydrafact completed a “Hydrate Risk Evaluation: Experimental and Modelling” for a company in the Central Asia. Hydrafact completed a solid deposition in diesel fuel for a company in Europe. Hydrafact completed Hydrafact completed hydrate point measurements on two hydraulic fluids for a company in Europe. Hydrafact provided HydraFLASH 3.3 to an institution in India. Hydrafact started a project for determining water content of a natural gas in equilibrium with hydrates for an oil company in Europe. The results of this work can be used in tuning/validating predictive software packages, as well as specifying dehydration requirements to avoid hydrates at certain P&T conditions. Hydrafact started a new KHI evaluation for 10 new KHI formulations for a company in the Middle East. Hydrafact has started a new project on evaluating risks associated with downhole wax/asphaltene deposition for a company in Europe. Hydrafact started a project on KHI dropping out of solution and associated problems for a major oil company. Hydrafact is in negotiation with a major company in the Middle East for deploying its novel HydraCHEK technology. A major company in Europe is planning to deploy Hydrafact’s “online HydraCHEK” in their field in the North Sea. Hydrafact is launching a Joint Industry Project, entitled, “Wax: Risk Evaluation and Monitoring”. Please feel free contacting us if you require further information. Hydrafact is planning to deliver a new edition of “Gas Hydrates and Flow Assurance” by Professor Bahman Tohidi in Aberdeen in the 1Q 2017 in Aberdeen. Please contact us if you are interested in this course. Hydrafact provided parts of its software in DLL format to a company in Europe. Hydrafact took part in Scottish Pavilion in the Mediterranean Offshore Conference and Exhibition MOC 2016, Alexandria, Egypt, as well as presenting a Poster on Asphaltene, entitled, “The Status of the Advanced Technologies in Asphaltene Precipitation, Deposition and Remediation”. Hydrafact played a major role in Heriot-Watt University winning the Queen Anniversary Prizes for “Science and innovation for the oil and gas sector in increasing productivity and reducing contamination”. One example was the deployment of Hydrafact novel technology, HydraCHEK, by Total in the North Sea resulted in some 3.5 MBOE extra production, extending the life of reservoir by 5 years and reducing methanol injection from designed 28 wt% to zero. Online HydraCHEK has been deployed in a field in the Mediterranean Sea for field trial. HydraFLASH 3.2 released in October 2015! Hydrafact completes a series of tests on saturated saline systems at 28,000 psia for a client in the USA. Hydrafact conducted experiments to investigate Joule-Thomason effect on a gas for a client in South America. Hydrafact was appointed to provide Guidelines for Hydrate Prevention and Remedy by a major oil company. Hydrafact completed a KHI investigation for a company in the Middle East. Hydrafact completed a KHI evaluation for a client in Canada. Hydrafact predictions on the effect of drilling fluids on the hydrate stability zone of several reservoir fluids. Hydrafact provided training to a group of professionals from Russia. Hydrafact and Sand Monitoring Services (SMS) sign collaboration MOU. Hydrafact conducted solid formation in diesel fuel for a company in USA. A major company in the UK renewed their HydraFLASH software license. A major company in Central Asia renewed their HydraFLASH software license for three years. Hydrafact conducted CO2-rich mixture density measurement for a research centre in the UK. Hydrafact completed a high pressure asphaltene study for a company in Europe. Two companies in Canada and Mexico purchased commercial versions of HydraFLASH software. A major company renewed their HydraFLASH support agreement. Hydrafact completed a major Anti-Agglomerants (AA) comparative study (using Rocking Cells and Autoclaves) for a company in the USA. Hydrafact provided consultancy services to a company for hydrate blockage removal. Hydrafact provided KHI evaluation support to a major company in the USA, using both its novel Crystal Growth Inhibition (CGI) and conventional Induction Time techniques. Hydrafact completed a water content measurement for a company in France. Hydrafact successfully supported a cold start-up of a pipeline in the North Sea. University of Portsmouth received 10 academic copies of our Hydrate and Phase Behaviour Model, HydraFLASH. A university in India purchased academic copies of our software, HydraFLASH. Hydrafact completed a comprehensive flow assurance study (hydrates, wax, foaming, emulsion, corrosion, scale) for a client in Central Asia. Hydrafact Successfully Removed Hydrate Blockage from Subsea Pipeline System! Hydrafact were recently approached by an operator to investigate a severe hydrate blockage in a pipeline in the North Sea. After careful system analysis by our hydrate experts, a plan was drawn up to safely remove the hydrate blockage. The plan was executed successfully resulting in the removal of the blockage without the need for any subsea intervention in a relatively short period of time. Consequently, this resulted in a significant cost saving for the operator compared to conventional techniques and a substantial reduction in deferred production. HydraFLASH Modelling & Training Course Announced! On 2 December 2014, Hydrafact will be hosting a training course for HydraFLASH 3.0 at our offices in Edinburgh. This is an excellent opportunity to learn, first hand, how to use HydraFLASH to its full potential and in general, learn more about gas hydrates and PVT. *Cost: Free for existing clients. A small fee (£250+VAT, if applicable) will be charged to others, but this fee will be deductible from software cost, if it is purchased after the course. Spaces are limited. Please contact us ASAP if you are interested in attending. For more details, please contact us at hydraflash@hydrafact.com . We are pleased to announce that the latest edition of our gas hydrate and thermodynamic prediction software (HydraFLASH) is finally here. A new database management system – this allows users to store all their data including compositions, preferences and results. Full access to our previous edition of the software HydraFLASH 2.2.21. For more details, please see our software page. We are pleased and proud to announce the official launch of our new and improved website. The stylish new design and minimalistic interface provides users with easier access to the information they require while delivering excellent usability and user experience. Please keep checking back for updates on our latest products, services and upcoming technology. We value each and every one of your opinions. As such, we welcome any feedback or comments you have (positive or negative) on the look or usablity of our new website. If you feel anything is missing, you'd like to give your opinion or you simply want to get in touch, please don't hesiate to contact us at info@hydrafact.com .